By: Prof. C. A. Grimbergen. that sawing wood beside the Zaan’. The timber sawing industry in the Zaan region reached its optimum during the 17th century. Following the patenting of crankshaft applications in 1592 (Cornelis Corneliszoon of Uitgeest), by 1700 there were about 180 timber mills (and more than 400 hundred other mills) in the Zaan region. Due to the fact that there were no guilds in the Zaan region, workers from other areas were able to establish themselves in the region. This was one of the reasons why the Zaan region became the first industrial area in Europe and the industrial area for nearby Amsterdam which had increased its development during the golden age. Freedom of religion fitted into this commercial climate. 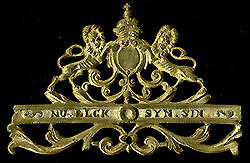 The maxim Nu Elck Syn Sin (‘to each his own’) characterized the Mennonite outlook in this region. Shortly after the introduction of the pendulum by Christiaan Huygens (1656), a regional pendulum clock was introduced in the Zaan region. The production of these clocks dated from around 1670 to 1730. Zaan clocks were probably derived from the West Frisian wall clock. This clock stood on four legs, the so-called stool, whereas the Zaan clock stood on two brackets which are attached to the wallboard. The poor man’s clocks were probably produced for local use and were generally not signed. They were made of untreated oak wood and painted in the style of local traditional furniture. They were fitted with one hand and the weights were usually cylindrical in form. Few examples have survived and the value of those that have survived has therefore become relatively high. A few clocks which were specially made for Mennonite churches are known. These have an extra option whereby the clock can be seen not only from the church but also from the adjacent vestry. Rich man’s clocks were usually made from oak with an ebony, rosewood or walnut veneer. Brass was used abundantly both in the case and for the ornaments. The chapter ring was made of silver-plated brass and attached to the velvet covered dial. Weights were generally pear-shaped. This type of Zaan clock was produced for sale outside the Zaan region. It is known that many were rented as alarm clocks. The rich man’s clock was used as model for the mass-produced Zaan style clock found in many a Dutch living room since the fifties. Names of various Zaan clockmakers appeared on so-called long case clocks from the second half of the 18th century onwards. This luxury type of long case clock was so called because the one meter long second pendulum with anchor escapement and the weights were both placed in the foot of the clock. The case was usually made of oak veneered with walnut or mahogany wood. The hood was usually decorated with ornamental open fretwork similar to Amsterdam examples. Zaan long case clocks differed from others of the same period as they were signed whereas other long case clocks were usually sold as half-finished products. ● by D.J. Volger exhibited in the Dutch Gold, Silver and Clock Museum in Schoonhoven. Strangely, few pocket watches are attributed to Zaan clockmakers (see clocks 19 and 20). It is also quite remarkable that so many of the Zaan clockmakers had a Mennonite background. The movement of the Zaan clock consists of a going train and a striking train placed behind each other and moved by an endless chord after that of Huygens, one weight and a small counterweight. The movements are usually located between several connected brass strips. There is always an alarm movement which is located separately in the case roof. The going train has a vertical verge escapement, whereby the carrier hooks onto the pendulum loop. Thus the angle is reduced resulting in the pendulum having a lesser amplitude than, for instance, that of the Frisian stool clock. This enables the 75cm pendulum to swing within the hollow space in the wallboard. The striking train is fitted with a nag’s head and does not therefore have a warning. There is a double locking plate and a switch mechanism to enable the ‘Dutch striking train’, a complete number of strikes on the whole hour (on the large bell) and on the half hour (on the small bell). Sometimes a quarter-hand is fitted under the chapter ring and this is connected to the striking chain switch. Heart-shaped spoke wheels are often used in both the going train and in the striking train. The wallboard used in Zaan clocks varies. Those with the clocks placed on a straight wallboard are called ‘op schoolbord’ after the wooden school satchels used in those days. The vase-shaped wallboards are related to those used in Frisian stool clocks. The cast metal ornaments show heraldic illustrations, such as coats-of-arms surrounded by lions or angels, or Christian illustrations such as Faith, Love and Hope. The bell is crowned by figures from classic mythology such as Atlas (carrier of the universe), Minerva (goddess of knowledge) or Mercury (god of trade). The pendulum weight often depicts a horseman. Four cherubs made of cast brass often decorate the four corners of the chapter ring on the rich man’s clocks.